Written off by just about everyone heading into the finals, the Eagles seized a premiership for themselves in the best decider played in more than half a decade. With a two-point lead, Jack Crisp kicks long from the edge of defensive 50 to the wing, just over the heads of Elliot Yeo and Nathan Vardy, and the ball spills to a running Adam Treloar. It’s a small but significant win for speed over height, in a grand final that has been defined by that battle. Treloar explodes along the boundary and smacks the ball inside 50 off his left boot. The ball is headed to a one-on-one, Lewis Jetta versus Brody Mihocek. But then, as he has all day, Jeremy McGovern emerges from nowhere to determine the contest. He rises up with time standing still for a second as Mihocek’s flailing body keeps McGovern airborne. 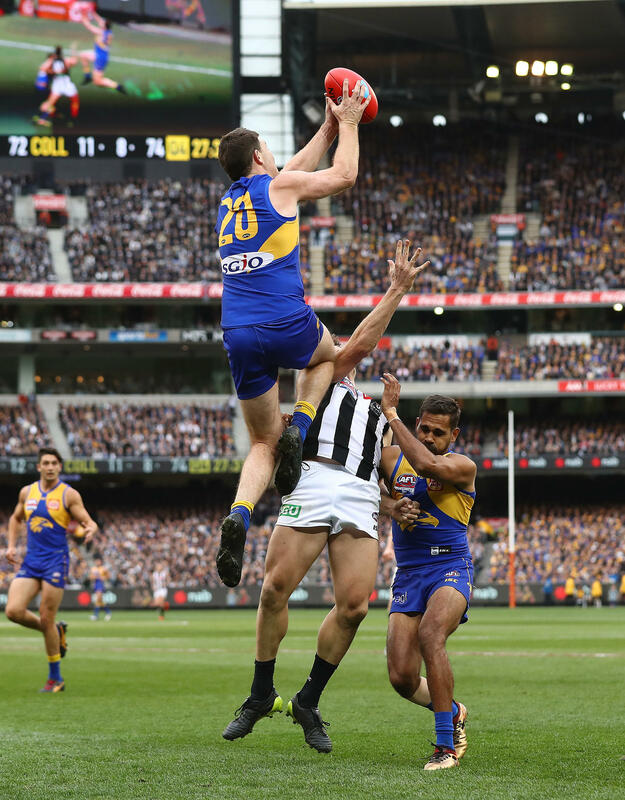 After taking the grab – a mark that West Coast fans will replay on their screens forever and Collingwood fans will replay in their minds even longer – McGovern plays on and places a perfectly weighted pass onto the chest of the leading Vardy. Vardy turns around and kicks long to half-forward. Crisp and Tom Langdon, Collingwood’s two best defenders on the day, bookend the space of the contest, but Liam Ryan is about to own the only space that matters. A quarter after he thought twice about going for a mark, there is no hesitation this time from Ryan, only magic. Running backwards, he tracks the flight of the ball, never taking his eyes off it, sets himself and then rises to meet it, indifferent to the collision of bodies about to come. He takes the mark, a mark even better than McGovern’s, and like McGovern has the presence of mind to move the ball on immediately. He lofts the ball into the forward pocket, where Dom Sheed, who through the course of the season has played the role of disappointment, forgotten man, and now unlikely saviour, is there to meet it. It’s the right pocket for a left-footer, but the angle is fine, the margin for error non-existent. Sheed carefully goes back on his mark and takes a short-run up, making a complicated equation a little simpler. He guides the ball with his left boot as his right stays planted, a picture of balance. The kick never looks like missing, his shot a video tutorial on how to kick a football perfectly, filmed in the last two minutes of a grand final. Three plays – call it the immaculate chain. The 2016 and 2017 grand finals both felt like movies. 2018 felt like football. In the aftermath of the Bulldogs and Richmond premierships, the fans – tortured at the bounce, ecstatic by the siren – took centre stage. Stories beyond football were the focus, the game itself a vehicle for deeper messages about sport and fandom. This year lacked that emotion, but made up for it with football. Football was the focus, and what it delivered was the best grand final since 2012. The game was a magnificent display of the sport, the deeper messages not about loyalty or faith or someone’s father who was a Bulldogs fan in 1954, but instead about kick-to-handball ratios and the importance of controlling attacking territory. There’s a time for all our fathers, but this grand final was a welcome return to pure football, without the narratives or the angst. The game also felt quintessential. This wasn’t just an advertisement for the sport, but specifically for the game in its modern form. Football is about territory now, at the expense of traditional one-on-one match-ups. This isn’t a bad thing. The grand final was exhilarating, a masterpiece of escalating tension. A team trapped in its defensive half is oddly captivating, an exercise in survival and endurance, as the ball comes in high and long and the bodies crash into each other over and over again. There is the hope, spawned by the size of the ground, that a fast-break the other way is always possible, that the pressure won’t just be absorbed but also used as energy to slingshot the ball the other way. This hope is usually misguided, but sometimes it’s not, and the result is spectacular. The Bulldogs came from nowhere and the Tigers came from somewhere only slightly more locatable than nowhere. The Eagles have been here all along. Looking back, we will see the game, as we usually do, through the prism of the victor. West Coast’s story is not as momentous or cinematic as the Bulldogs’ or Richmond’s, but in its own indie production way it’s every bit as uplifting and reassuring. The Bulldogs came from nowhere and the Tigers came from somewhere only slightly more locatable than nowhere. The Eagles have been here all along. Four years in a row they’ve played and won finals, clearly the most successful team over that period. It feels like this iteration of West Coast has been around even longer than that, though, and indeed, Luke Shuey, Josh Kennedy, Jack Darling, Shannon Hurn, Will Schofield and Chris Masten were all playing finals against Collingwood at the MCG in 2011 and 2012. The Eagles had been knocking on the door ever since their emergence in 2011 from the gloom of the post-Chris Judd/Ben Cousins era. Despite making it to September five times in seven years, though, they never got over line, and lost all four of the finals they played at the MCG. Maybe because of this we thought a little less of them – there just seemed to be something a little absent in the DNA. That absence was most emphatic in the destructive losses to end their 2015 and 2016 seasons – the former a disastrous no-show on the biggest stage and the latter an incredible annihilation at the hands of the Bulldogs in Perth. Those defeats, coupled with an underwhelming 2017 that felt like the end of something, suggested West Coast’s time was up and it was going to take new blood and a few years for the team to re-emerge as a contender. Last year’s Eagles had quality all over the ground but also glaring, exploitable weaknesses. The main one was simple: they were too slow. They played three tall forwards, the third being the team’s resting ruckman, with the weary legs of Mark LeCras alongside them. Matt Priddis and Sam Mitchell, 32 and 35, started in the middle – the game had not quite gone by them, but other midfielders did so with ease. With Nic Naitanui sidelined, there was a lack of dynamism on-field that seemed to reflect the broader fatigue around the side that had set in. The 2017 team was the same old group, which had only added one new piece, the oldest player at the club. You knew what you were getting with the Eagles, the story was always the same. The defence was rock solid. The midfield had a lot of class but not enough madness. The forward line had Josh Kennedy, who was terrifying, then a host of other complements who were not. Often it felt like West Coast’s hopes were dependent on Kennedy winning games off his own boot, in an era where it had never been harder for key forwards to take over games. They had enough talent and structure to take care of business at home, but on the road they were a disaster, not just losing games but looking lethargic and absent – they would lose the contested possession battle in 11 of their 12 road games, six times by 19+. The team hit rock bottom in Round 18 last year against the Magpies in Melbourne. The Eagles coughed up a late lead that day in a game that meant a lot to them and nothing tangible to their opponent. They looked lifeless and frozen, with Collingwood players crashing into the contest at pace while Eagles stood around and waited for things to happen. In the final term, 12 West Coast players failed to win a single contested possession. They were going through the motions, there was no joy about the team, only a listless sort of competence – they played like a faded memory. Watching West Coast games was like watching repeat episodes of a middling procedural drama. How we got from there to one of the most complete, impressive and resilient premiership seasons in recent history is one of football’s great stories. In 2017, the Eagles had the oldest, most experienced team in the competition. Experience can make you ripe for contention, but it had made this lot stale and predictable. They needed new life. Enter Willie Rioli and Liam Ryan. The pair had pace, explosion, skill to burn, and a vicious goal-sense. Immediately, they added the flair and vitality that the team had been missing. In the past, teams could breathe if Josh Kennedy didn’t take the mark inside 50. Now, the air was just the first battle, with the ground just as frightening, that new duo ready to pounce at any time and turn quarter-chances into exquisite goals. The presence of Rioli and Ryan seemed to ignite the other two small forwards, both of whom had been trending towards irrelevance. Jamie Cripps was a totally inoffensive football player. He was just another guy, Chris Mayne but two inches shorter with a more conservative haircut. And then this season he lifted, winning more of the ball than ever before, kicking more goals than ever before. He was always a great tackler, but this year he added real class to his finishing. Mark LeCras has never lacked for class. His ‘class’ had become a tongue-in-cheek cliché, something to mock, as though his polish with the ball only highlighted his unwillingness to get his hands dirty. Last year, LeCras looked finished. He looked slow and either disinterested in applying pressure or unable to. He was the least physical player in the league. This year, he played with burst again, and a degree of force. Last year he waited, this year he hunted. He still kicked his goals – that perfect set-shot routine, the same narrow run-up and simple motion every time, as the right leg skies up and to the left as the ball goes invariably straight – but he added pressure back into his game. In both 2017 and 2018, LeCras kicked 32.21 – the difference, and it made all the difference, was that he went from 45 tackles to 70, from nine free kicks won to 22. But the biggest transformation in the forward line came from the player who carried the most baggage. 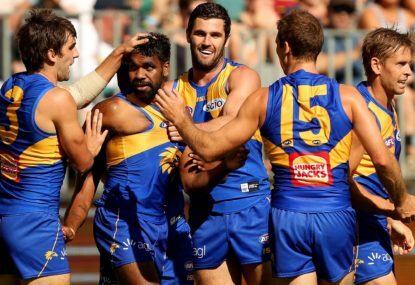 Liam Ryan’s introduction to the West Coast forward line – along with Willie Rioli – invigorated the group. 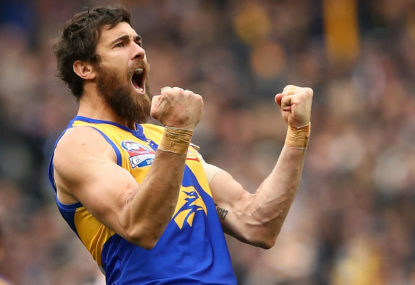 Jack Darling is the best symbol of the Eagles. The talent has always been undeniable, awe-inspiring in flashes. His physical profile is absurd, a 95-kilogram mountain with pace and a low centre of gravity closer to a midfielder than a key forward. He’s a tenacious tackler, imposing in the air, and a beautiful, reliable kick for goal. Like the Eagles got their wins, Darling always got his numbers – 40+ goals a season, 12 touches and five marks a game. He was a fine player. The Eagles were a fine team. But something was missing. On the biggest stage, famously, Darling screwed up as badly as you can screw up. West Coast mounted one charge in the 2015 grand final, and it ended when Darling ran back with the flight of the ball inside 50 and let an uncontested mark hit him in the chin and then the chest before he spectacularly fumbled the spill as well. The Hawks scored directly from the turnover and the season was over. Darling’s reputation was confirmed the following year when he pulled out of a marking contest in the final against the Bulldogs. It takes a good player to live with that history – it takes a great one to erase it. Darling became that player this season. For the first nine weeks, he was the best player in the competition. All the tools were finally pieced together, the rampaging physicality fully unleashed by a new mentality to dominate. Previously, Darling would regularly go stretches where you would forget he was on the ground, or confuse him for just another player. This season, you never forgot when he was near the ball – his presence was commanding and undeniable. He took contested marks in Wayne Carey fashion, his leap a perfect extension of his run, his hands vice-like, his figure so powerful that neighbouring bodies only bounced off of him. For a time, he relegated Josh Kennedy to sidekick status. It was fitting, then, that the grand final turned largely because Darling made it turn, his four contested marks in the third quarter so crucial. He played the first half as though he could see that dropped mark in his mind at every second. Even in the second half he still looked a touch nervous – epitomised, of course, by what could have become the greatest gaffe in football history. But he was a superhero out there all the same, his talents unlocked now, his body too powerful to be tied down by thoughts. This was year five of the Adam Simpson era, the fourth year in a row of knocking on the door. The Eagles made themselves known in 2015, propelled by a structure that was part-revolution, part-smoke and mirrors, finally destroyed by the Hawks. Then, they toiled. 2016 and 2017 were underwhelming, with the destructive end to 2015 and then Nic Naitanui’s injury seeming to cast a pall over the team. 2017 especially was a disappointment, partly redeemed by one magical moment in Adelaide, and looked to set the team on a rebuilding course. When the oldest team in the league loses in the second week of finals by 11 goals, bids adieu to its two most accomplished players, and then makes no marquee additions in the off-season, you do not expect great things in the immediate future. But the team still had top-end quality in every part of the ground, with Kennedy, Luke Shuey, Andrew Gaff and McGovern unquestioned A-graders, and a depth of competence beneath them. They had Naitanui coming back to reinvigorate the midfield, and perhaps the team overall. They were too talented to blow things up. They just had to make a few tweaks. The departures of Mitchell and Priddis released Elliot Yeo into the midfield. Yeo was already an excellent player, a semi-star who emerged as a superstar this year, a contested ball and aerial beast, with a freakish elastic physicality and an insatiable hunger to bowl over human bodies. In 2015, the Eagles thrived by making the ground as small as possible for their opponent. In 2018, they succeeded by doing the complete opposite. Jack Redden rose to meet his increased responsibility in the middle, having a career year, and Gaff added a real inside game to his already dominant outside play, in the process becoming the team’s best player and one of the finest in the competition. Shannon Hurn was another to have his best season, the skipper becoming more of an intercept marker than ever before. Rioli, Ryan, Daniel Venables and Tom Cole gave the team more youth and pace, and Chris Masten’s career was rejuvenated on the wing. The team adjusted its game style in a way that brilliantly maximised the team’s personnel. What were the Eagles best at? Kicking the ball and marking it. So that’s what they did. They had the highest kick-to-handball ratio in the league, committed to playing a patient but decisive game of possession football, switching the play in defence and always looking for the structure-piercing pass. In 2015, the Eagles thrived by making the ground as small as possible for their opponent. In 2018, they succeeded by making the ground as big as possible for themselves. It had to have been more complicated than this, but at times the West Coast game-plan out of defence looked exceedingly simple: hit short targets until you get to the wing then kick it long to Kennedy or Darling and either they will mark it or Rioli, LeCras, Ryan or Cripps will rove the spill. This was, it turned out, unstoppable. For the first three months of the season, the Eagles were a juggernaut. They’d won ten games in a row and sat top of the table. This run included one of the best four-game stretches in recent history – crushing Port by seven goals, toying with the Giants in a 26-point win, eviscerating the reigning premiers by eight goals, then taking care of business in Melbourne against the Hawks. That run confirmed the Eagles as a team to be feared, maybe the team to be feared. Then adversity began to strike. First it came in light, manageable doses. Darling went down against the Saints, but it wasn’t as bad as initially feared. But then Kennedy got hurt the game afterwards, and all of a sudden the best forward line in the game was set to be one of the worst for a few weeks. Three dispiriting losses, the latter two where the Eagles looked completely lost without their two big star forwards, were followed by a gritty win over the resurgent Giants in Perth. Then came Collingwood. Kennedy and Darling returned for the blockbuster at the MCG but the Eagles came in underdogs, with everything to prove. ‘Everything’ was proven – the Eagles absorbing Collingwood’s initial burst then schooling the Pies in the second half with a clinical display of possession kicking football – but at a high cost, with Naitanui going down for the year. It just didn’t feel like a premiership group. There was too much Dom Sheed about this team. That, as it turned out, proved to be true. Three weeks later and the Gaff incident occurred, meaning that the Eagles would have to win the premiership without their most talismanic player and their best player. West Coast, though, found a way. They held onto second spot, securing a home qualifying final, the regular season’s greatest reward. Scepticism still reigned. People just didn’t want to believe in the Eagles. They were written off when Naitanui went down, then written off some more when Gaff sentenced himself to the sidelines. The forward line was imposing and the defence was respected, but you looked at the midfield and it was too hard to see a premiership from that group. Yeo, Shuey, Sheed, Redden, Masten and Mark Hutchings with Scott Lycett and Nathan Vardy rucking. On paper, it just didn’t feel like a premiership group. There was too much Dom Sheed about this team. That, as it turned out, proved to be true – there was too much Dom Sheed, but for Collingwood. Popular perception made a few mistakes. Redden was underrated, having turned himself into a quality mid, tough and clean in close. Lycett and Vardy didn’t get enough credit, tireless workers who fit seamlessly into their role – try and halve the ruck contest, make life miserable for the opposing ruckman around the ground, and drift forward to be a marking presence. Shuey and Yeo were considered very good players, but they’re champions. The Eagles likely don’t make the grand final without Yeo’s colossal performance in the qualifying final, the type of display Collingwood fans hadn’t seen in a final since Brendon Goddard. Then Shuey raised the bar. He was everywhere in the grand final – dragging the Eagles back into the contest in the first half, then steering them home at the death. He’s fearless, brutal, intelligent with the ball, and his ability to exit stoppages at pace is almost unmatched. Luke Shuey’s grand final performance was one for the ages. In that regard, at times, he resembles a stockier, less graceful Chris Judd. Given the circumstances, Shuey’s grand final was as good as any game that Judd ever played, or any other Eagle for that matter. The Eagles on the field were underrated, and the importance of those stuck off of it was overstated. The true significance of a number one ruckman is unclear. Understanding stoppages in football is like understanding offensive line play in gridiron. The flashing lights moment – a player left unattended to rove a goal from a throw-in inside 50 – draws our attention, and we might understand a few things on replay. But in real-time, we don’t know much. And for that reason, we don’t really know much about ruckmen. Nic Naitanui was one of the few we did know about. His taps to advantage are the most spectacular in the league and his presence at ground level the most terrifying for opponents. He does two or three breathtaking, game-changing things each game that inject his team with sudden life. The Eagles would suffer without him, but they weren’t lost. They’d just have to dig a little deeper to find within their fit players a few more special moments to compensate – an extra McGovern intercept, an extra Shuey clearance at pace, an extra contest devoured by Yeo. And they did that just fine. We figured Gaff being gone would break them. But as good as he is – and he is one of the 15 best players in the competition – he’s just one midfielder. And in Sheed, the Eagles had something of a Gaff facsimile waiting in the ranks. Sheed wasn’t Gaff, but he could provide 75 per cent of Gaff’s impact, and as it happened, for a five-game stretch to end the season, he gave them close to 100 per cent. This season revealed that there are probably only three irreplaceable Eagles: Kennedy, Darling and McGovern. Shuey is the heart of the team, Hurn its cool hand, Yeo its adrenalin, Rioli and Ryan its spark, but it’s the three beasts in the air that gives the team its identity. Josh Kennedy was instrumental in the grand final – much to the surprise of pretty much no one. What has always separated the Eagles has been their ability to soar. They own the air and when the grand final started to slip away, and then when it was there to be taken, they took the fight to the sky. Kennedy, Darling and McGovern rise in different ways. Kennedy leaps like he’s trying to eat the sky and the world beyond it. Darling is more textbook, attacking the ball as the classical centre half-forward is supposed to. And McGovern is the most special – an odd sort of tall square on pegs that all of a sudden is gliding. He is a fearless genius, drifting from his man as though his body is being magnetically drawn to the most important spaces. He turns good inside 50 entries into bad ones and makes bad ones look downright offensive. Close your eyes and think of McGovern and it’s the same thing every time – strafing and then rising. Now, he will never be forgotten – he has this moment, etched in football history. Shuey was the best player in the grand final, but when the robots take over and everything can be reduced to quantitative certainty, we might find that McGovern was the most pivotal player against the Magpies. He, Tom Barrass and Will Schofield were the heroes on the last line – they kept the Eagles alive when the game felt like it was one or two moments from being over, and then when it was in the balance they kept tilting things in West Coast’s direction, one intercept mark after another. Every season provides a lesson, at least after we dig deep enough for one, the year’s end always making us hungry for reflection. The lesson to be taken from the Eagles is clear: the path from contention to a premiership is not always linear, and if you have great players, then you always have the hope of having a great team. This year, the Eagles became that great team, punctuating an era of success with the ultimate success. They were close the past three years, closer than we gave them credit for. It seemed like revolution was in order, but all they needed was a little more Jack Redden. Adam Simpson and his staff tweaked the game style, and the playing group, which some expected to be tired and jaded, actioned it with all their life. Simpson seems a humble figure, and the final failures of 2015-17 didn’t break him, they just added more pieces to the puzzle. In 2015, the Eagles played one style. By 2018, they played whichever one they needed to win. They could play the possession kicking game that got them back into the grand final or they could be ferocious in the contest, as they needed to be and were in the final quarter of the qualifying final and the first quarter of the prelim. This was an easy team for the neutral to get behind. They were tough, honest and exciting. They played the right way, a cohesive, selfless group that played hard and played together. There was a flat-track bullies label and the suspicion that they might be soft – they dispelled all that by being as hard as you can be on the toughest track of all. The Eagles weren’t in front for long, but now they’re in front for eternity. They didn’t coast on talent – they maximised every last drop that they had. They had a few stars and then an army of role players. More than anything, they were committed and they believed. They lost their best player, their star ruckman and their best small defender and still steered themselves to the final day. On that day, when it was all falling apart, when it was 31-2 and you figured that they might be seeing Hawthorn guernseys on the Collingwood players, they pulled themselves up, stayed alive, and then ran with that life. They ran with it all the way to a premiership, from 31-2, from two different two-goal deficits in the final term, from a deficit in the final two minutes. They weren’t in front for long, but now they’re in front for eternity. This West Coast team is an unusual inspiration. They’re not an inspiration to communities or people across the country like the Bulldogs were – they’re more an inspiration to football departments across the AFL. They’re a reminder that you’re always a chance, that you’re not beholden to the path that seems most obvious. Geelong, Adelaide and Sydney, teams now where the Eagles were this time last year, seemingly at the end of something but still with shining talent, will look to West Coast as a source of energy. Collingwood will also look to the Eagles as comfort and a reminder that you’re never sentenced to only one chance – if you’re hard enough and smart enough, you can make it back. The Eagles made it back. They made it all the way back. McGovern marked, Ryan flew, and Sheed kicked the ball dead straight. Jay Croucher has been a Roar expert since 2015, specialising in Australian Rules Football, American football and NBA. From MSG in New York to the MCG in Melbourne, Jay has spent his adult life travelling the world, indulging in sport and approaching it from the angle of history and pop culture. Follow him on Twitter @CroucherJD.